The story is set in the sleepy Alabama town of Maycomb in 1936, forty years after the Supreme Court’s notorious declaration of the races as being “separate but equal”, and 28 years before the enactment of the Civil Rights Act. Our narrator is 9-year-old tomboy, Scout Finch, who relays her observations of her family’s struggle to deal with the class and racial prejudice shown towards the local African American community. One might expect a book that dispatches moral lessons to be dull reading. But To Kill a Mockingbird is no sermon. The lessons are presented in a seemingly effortless style, all the while tackling the complexity of race issues with startling clarity and a strong sense of reality. 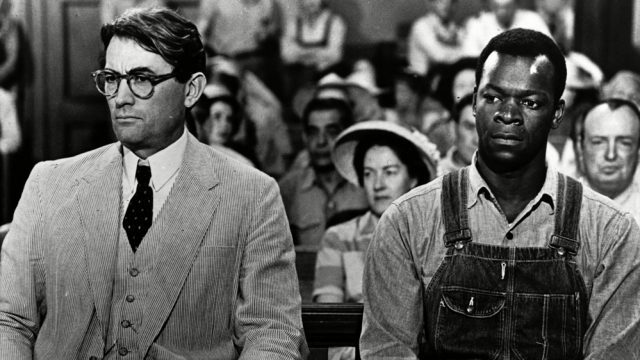 Despite the tragedy of Robinson’s conviction, Atticus succeeds in making the townspeople consider and struggle with their prejudice. Atticus Finch delivers his closing statement in the trial of Tom Robinson in the 1962 film. The effortlessness of the writing owes much to the way the story is told. The narrator is a grown Scout, looking back on her childhood. When she begins her story, she seems more interested in telling us about the people and incidents that occupied her 6-year-old imagination. Only slowly does she come to the events that changed everything for her and Jem, which were set in motion long before their time. Even then, she tells these events in a way that shows she was too young to always grasp their significance. The lessons Lee sets out are encapsulated in episodes that are as funny as they are serious, much like Aesop’s Fables. A case in point is when the children return home from the school concert with Scout still dressed in her outlandish ham costume. In the dark they are chased and attacked by Bob Ewell, the father of the woman whom Robinson allegedly raped. Ewell, armed with a knife, attempts to stab Scout, but the shapeless wire cage of the ham causes her to loose balance and the knife to go astray. In the struggle that ensues someone pulls Ewell off the teetering body of Scout and he falls on the knife. It was Boo Radley who saved her. Another lesson about what it means to be truly brave is delivered in an enthralling episode where a local farmer’s dog suddenly becomes rabid and threatens to infect all the townsfolk with his deadly drool. Scout and Jem are surprised when their bespectacled, bookish father turns out to have a “God-given talent” with a rifle; it is he who fires the single shot that will render the townsfolk safe. The children rejoice at what they consider an impressive display of courage. However, he tells them that what he did was not truly brave. The better example of courage, he tells them, is Mrs Dubose (the “mean” old lady who lived down the road), who managed to cure herself of a morphine addiction even as she was dying a horribly painful death from cancer. The continuing value in Atticus’ belief in the importance of principled thinking, in the world of Black Lives Matter and the Australian government’s rhetoric of “African gangs”, is clear. Atticus’ spiel on “conscience” and the other ethical principles by which he insists on living, are key to the enduring influence of the novel. It conjures an ideal of moral standards and human behaviour that many people still aspire to today, even though the novel’s events and the characters belong to the past. When first published, the novel received rave reviews. A year later it won the Pulitzer Prize for Literature, which was followed by a movie adaptation in 1962 starring Gregory Peck. Indeed, the novel was such a success that Lee, unable to cope with all the attention and publicity, retired into obscurity. The latter statement is doubtless a reference to the autobiographical nature of her book. Lee passed her childhood in the rural town of Monroeville in the deep south, where her attorney father defended two black men accused of killing a shopkeeper. The accused were convicted and hanged. Undoubtedly influenced by these formative events, the biographical fiction Lee drew out of her family history became yet more complex upon the publication of her only other novel, Go Set a Watchman, in 2016. Critics panned it for lacking the light touch and humour of the first novel. They also decried the fact that the character of Atticus Finch was this time around a racist bigot, a feature that had the potential to taint the author’s legacy. Subsequent biographical research revealed that Go Set a Watchman was not a sequel, but the first draft of To Kill a Mockingbird. Following initial rejection by the publisher Lippincot, Lee reworked it into the superior novel many of us know and still love today. Lee gave us the portrait of one small town in the south during the depression years. But it was so filled with lively detail, and unforgettable characters with unforgettable names like Atticus, Scout, Calpurnia and Boo Radley that a universal story emerged, and with it, the novel’s continuing popularity.